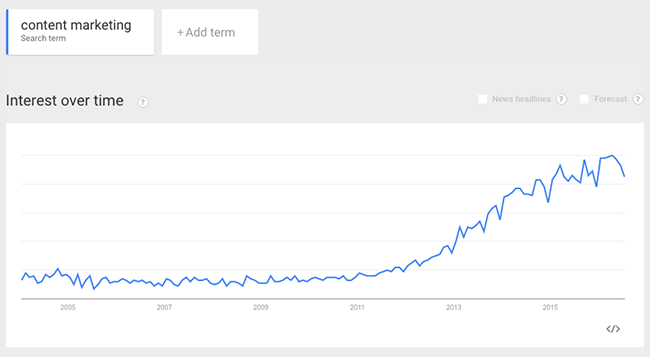 In recent years, the buzz around “content marketing” has grown. Content marketing-specific jobs are springing up everywhere. More than ever, businesses understand that without a detailed content strategy, they’re as good as dead. But content marketing isn’t new. Certainly not as new as this graph would suggest. Businesses have been producing content to create hype and desire for their solutions for a very long time. What’s new is the technology and channels we use to distribute this content. Content marketing has a rich history, and the folks over at Content Marketing Institute have put together this gem to tell the story (BTW, they even made a documentary too). It all starts in 1732 with a man you may have heard of: Mr. Benny Franklin.